You are here: Home / competitions / Win tickets to the DMC UK DJ Final at Scala! Its competition crazy here at Plain and Simple at the moment, not only are we giving away a pair of tickets to SPECTRUM, and to Layo and Bushwacka, and to the amazing SIRUP NATION FESTIVAL IN CROATIA..but now we’re also offering a pair of tickets to the UK DMC final at Scala…dont say we dont look after you! 2011 is a milestone year, not just for the competition, but yet again the DMC World DJ Championship’s boundary pushing will signal change in the wider world of technology. In its 27th successful year, DMC has brought together the globe’s brightest DJ talents, vetted by a series of gruelling heats from London to Tokyo to Brazil. This year, not only are DMC continuing to host one of the most entertaining and jaw dropping shows you will ever witness – but they have set the bar even higher. For the first time, competitors can harness the full spectrum of computer based DJ programs, most notably from trend-setters Serato. 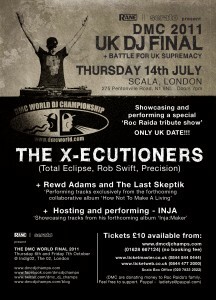 2011’s UK DJ Final and Battle For UK Supremacy takes place at the Scala on Thursday 14th July with the winners going head to head with the best in the world at the World DJ Championships on October 6th and 7th at Indig02. In a year where the production of the industry standard Technics turntables was halted for good, DMC have embraced the old and the new, the turntablism and the technology, and as well as using Serato within the battles, DMC are pushing things forward with an online DJ Championship, the launch of DMC Radio, a site re-launch, and making the World Finals available live on Pay-Per-View. With heavyweights Rane and Serato as sponsors, DMC are dedicated to moving to represent the current and future DJ. While change is afoot, the most important aspect of the DMCs has of course remained true to the art. To become a DMC World Champion, DJs around the world still need to use techniques such as scratching & cutting to manipulate turntables and vinyl in order to create their own musical arrangements, performing live in front of an audience filled with both the knowledgeable DMC fans and lucky newcomers being initiated to this fantastic contest. With World Championship winners over the years including the superstar likes of the Scratch Perverts, A-Trak, Q Bert, Craze and Mixmaster Mike (Beastie Boys), fame and respect could well accompany the bountiful prizes on offer (including a treasure trove of goodies provided by sponsors Rane, Serato, Novation and Sennheiser). In between the battles on the night, DMC have provided a real treat for hip-hop fans and devoted turntablism followers. The legendary DJ crew The X-Ecutioners will fly over especially for this exclusive UK date, performing a tribute showcase to the late great legend DMC World Champion – DJ Roc Raida. Remaining members Total Eclipse, Rob Swift and Precision will without a doubt be performing something incredibly special. DMC will be donating money to Roc Raida’s family. From the UK, critically lauded rapper Rewd Adams (formally known as Skandal) and producer The Last Skeptik will perform very exclusive tracks from their forthcoming collaborative LP ‘How Not To Make A Living’ due later this year. Charismatic host Inja returns for another successful year of hosting duties and will be performing tracks from his brand new album Inja:Maker. Plain and Simple are pleased to be offering one lucky reader a chance to win a pair of tickets to the UK finals at Scala on July 14th. To enter simply tell us: Where will the world championship final take place in October? Email your answer to jo@plainandsimple.tv – closing date for entries is July 8th. Win Guestlists and Bubbly for Slide & Get Diverted New Years’ Eve.